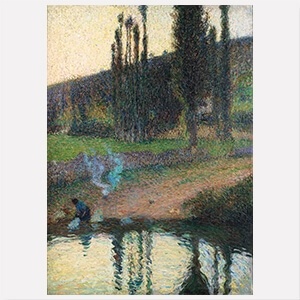 Henri Martin was born in Toulouse in 1860. After attending art school in his hometown, he moved to Paris in 1879 to study at the École des Beaux-Arts under Jean-Paul Laurens, then moving on to Rome on a fellowship awarded to him at the Paris Salon. After his return to Paris in 1889, Martin started experimenting with Pointillism. His work of the 1890s is characterized by a dreamy, ethereal mood and predominantly mystical or allegorical themes, indicating his affinities to the French Symbolists. Martin received several commissions for large-scale murals, e.g. for the Hôtel de Ville in Paris and the Capitole of Toulouse. Later in his career, Martin was increasingly drawn to landscape painting, depicting the idyllic scenery around his country house in Labastide-du-Vert near Toulouse, where he spent most of his summers capturing the vibrating light of the Midi. Martin died there in 1943.